Li's family accumulated wealth from international trade as well. Her parents used to hire a tutor from Shanghai to teach their sons English and other subjects at home. Li also had a chance to sit with her brothers in the class. The family's wealth is evident in the furniture and many of the architectural details, including: cast-iron railings at the top of an accountant's office that were imported from England and carried in by caravan from Myanmar; a huge safe in the office; a Western-style cooking range; and a hand-operated noodle press. These things were rare in the developed areas of eastern China until after reform and opening-up began in the late 1970s. Li says her family was very traditional and abided by many of the teachings from ancestral times, including letting the children study during the day but helping the parents at other times, instead of employing servants. What Li is particularly proud of is that her family were stalwart defenders of the nation during the War of Resistance Against Japanese Aggression (1931-45), including donating a warplane to the Chinese army. In Heshun, there was a museum devoted to that conflict. The museum has now been moved to the county town. Maintaining a family tradition of trading, most of Li's relatives have moved abroad and are now scattered throughout the world, she says, including one in Myanmar whom she visited last year. 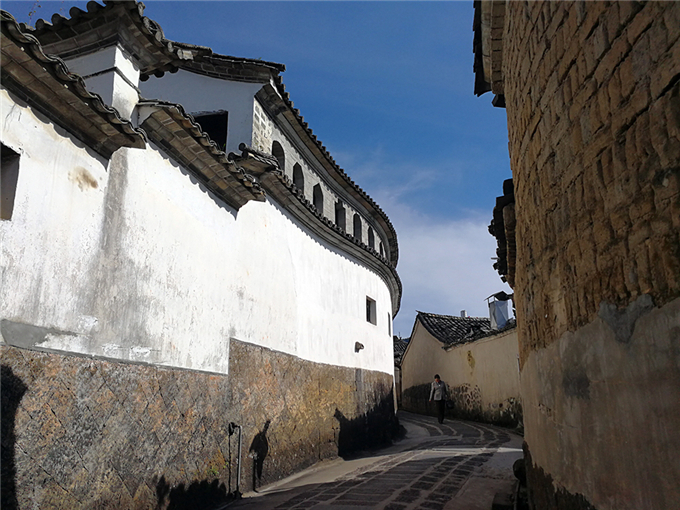 When you slowly walk around in the town, through the alleys and the streets paved with slab stones, you are likely to see the locals like Li, sitting relaxed in front of their houses or shops, or gathering at the entrances to alleys, seemingly assured that the pace of life will never be disturbed by the visitors.